After answering numerous questions each week regarding nutritional disease of goldfish, I realize the proper feeding of these animals is an important topic to discuss. In fact, you may have been referred to this article if you've written to the WetWebMedia Crew with a question about symptoms of nutritional disease in goldfish. Goldfish are primarily vegetarian by nature. In ponds, they prefer to snack on plants and algae throughout the day, and though they will also greedily snap up most insects that fall into their water, they do not consume much animal protein. Keep this in mind the next time you read the ingredients on the back of a can of goldfish food - you may well see that the primary ingredient is something like fish meal or shrimp meal. Feeding goldfish on a diet of primarily these high(ish) protein prepared foods is folly. This can and does cause them (especially "fancy", egg-shaped varieties) to become constipated and show dropsical symptoms ('Dropsy' is a condition of bloatedness, sometimes to the extent of the fish's scales sticking out at right angles to the body). 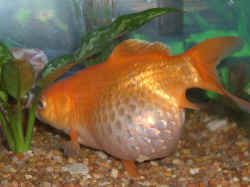 Very often, constipated goldfish lose equilibrium, tending to float upside down, yet still maintain their appetite and otherwise healthy appearance'¦ for a while. Too often, if this condition is permitted to persist, it will evolve into a fatty accumulation within the body of the fish that can be ultimately fatal to the animal. Many folks refer to this as 'gas-bladder disease' due to the fish's inability to remain upright. It is not true that goldfish achieve this set of symptoms by swallowing air with floating food. To an extent, goldfish are capable of gulping and 'burping' air to control the amount of gas in their swim bladder and somewhat control their buoyancy; swallowing air has nothing to do with this nutritional disease. It is not the fact that the food floats or sinks that is of importance, but the nutritional content of the food itself. 1. Discontinue all feeding of dried pelleted and flaked foods, and all other foods of high protein content (no more than 40% by dried weight, ideally, less than 20%). 2. Lower the water level in the aquarium if possible; this will give the fish some comfort in not having to struggle so much just to get around. Depending upon the type of filtration you use, you may wish to employ a sponge filter during this time. 3. Add Epsom Salt (magnesium sulfate) to the animal's aquarium, at a rate of one to two tablespoons per ten gallons. This can be done in the main system, and can be added again in a few days after a water change if the condition persists. This muscle relaxant will help the animal to pass any blockage in the gut. 4. Feed the animal (very, very sparingly!) foods high in roughage content (peas/cooked without shell, adult brine shrimp, daphnia), also to help as a laxative. Feed these foods exclusively until the constipation has improved or passed. 5. Once the fish has improved in condition, withhold high-protein foods, and use them only as occasional "treats". Permanently modify the animal's diet as explained further in this article. If we can't feed them plain old "goldfish flakes", what should they be eating? Again, by nature, these fish feed on vegetable matter; algae, plants, and decaying plant matter that has worked its way into their environment. Let's explore some food options for long-term feeding to maintain the health of goldfish. These should make up at least a part of your goldfish's diet, if not a great portion of it. I prefer to use Elodea and Egeria plants (commonly labeled also as "Anacharis" in aquarium stores) for this purpose, for the simple fact that they are so easy to grow - and so very, very tasty. Really, try it! (No, just kidding.... don't.) I have never yet found a goldfish that didn't appreciate some Egeria or Elodea in the tank constantly for munching. For more information on Elodea and Egeria for aquarium use, read here: http://www.wetwebmedia.com/PlantedTksSubWebIndex/elodea.htm . Salvinia, Lemna (Duckweed). This is a common "nuisance" plant, so use with caution. It can absolutely cover the surface of an aquarium in not much time at all. Plants to Avoid: Cabomba, Ceratophyllum/'Hornwort', and Myriophyllum'Foxtail/Milfoil', as these prove very difficult to grow or simply won't be eaten by goldfish. These are not good substitutes for any of the plants above. Human-Consumption Greens Yep, that's right, you now have something to do with the spinach that you or your children won't eat! To prepare most of these veggies, blanch them prior to feeding. If you didn't know or weren't sure, blanching just means to drop the item into a pot of boiling water for a short time.... ten seconds is fine'¦ or in a bit of water in the microwave for a minute or so. The purpose of this 'cooking' is to make the food item a little easier for our toothless goldfish to consume (and easier to digest, as well). It's simpler than having Goldie fitted with dentures, I assure you. Among the greens I use and recommend for this purpose are spinach, cucumber, squash, various lettuces, peas.... I have even been known to feed my goldfish canned asparagus. I *hate* the stuff, so they always get my share. You can even offer carrot from time to time as a bit of a color enhancer. If you use canned vegetables of any sort, make sure they do not have salt listed as an ingredient on the can, or rinse the food very, very thoroughly prior to feeding. Fresh vegetables are preferable. There are only a few prepared foods I tend to recommend for feeding goldfish. Always look at the ingredients on the can before you use the product - same as you might for your own food. Ocean Nutrition's "Formula Two" is a great frozen prepared food, and there are other veggie-based frozen foods that work just as well. I prefer the Ocean Nutrition food for the reason that it just stays together easier and makes less of a mess than others. Sushi Nori is a seaweed/algae that's used for wrapping sushi rolls. This is marketed as a premium fish food at some fish stores, but can be purchased at oriental food markets for a fraction of the price. This can be tied to a rock to keep it submerged, or you can use a clip sold in fish stores for this express purpose. I like the clips for their ease of use; you can put your spinach or lettuce in the clip as well to keep it mostly in one place. This just makes for easier clean-up. In all honesty, I don't feed the goldfish in my pond. I haven't in years. I keep plenty of aquatic plants, floating and submerged, for them to eat, and never clean any algae -- they do it for me. They are all of appropriate size, growing, and even occasionally spawning. Of course, I only have three goldfish in a small pond of 200 gallons, so depending upon your stocking density and the amount of plants in your system, you may wish to supplement them with other foods. It is difficult to give a rule of thumb about how much and how often goldfish should be fed.... Most goldfish, most systems are best fed a couple times a day, but not much per time. This is actually easiest to figure out by trial and error. If in doubt, start with a quantity and frequency that you feel is too little for the animals; if they begin to lose weight over a period of time, increase amount or frequency of feeding. If they start looking a little too well fed, decrease amount or frequency.... it's that simple. A quick word of warning, though; overfeeding goldfish is much more hazardous to their health than underfeeding them, so do please err on the side of caution. No 'left over' food should be in the system a few minutes after feeding. If there is, you should vacuum it out. It's indeed a great shame that so many fancy goldfishes meet an untimely and unpleasant floaty bloaty end from a lack of understanding of their simple nutritional needs. You can prevent so-called 'gas-bladder disease' in your Orandas, Lionheads, Moors, Ranchus et al. egg-shaped goldfish with a sufficiently low protein, vegetable-based diet, or better still, do what I do, and grow your own greens right in their environment. Barring or in addition to live greens, you can easily supplement your goldfish's diet with terrestrial vegetables prepared by blanching or microwaving. The amount and frequency of feeding goldfish is important. They prefer regular meals, but not in excess. Left-over food should be removed if present more than a few minutes after feeding. Once your fancy goldfish have developed symptoms (floating, disorientation, dropsy), an aggressive treatment with Epsom Salt, lowered water level, all-vegetable diet, monitoring of water quality and frequent water changes'¦ may take weeks to months to reverse the damage. Likely mis-feeding ranks near the top (along with being in too small, unfiltered circumstances) as cause of loss of fancy goldfish. Be aware that the kinds, amounts, and frequency of feeding determines the state of health or disease of your livestock.